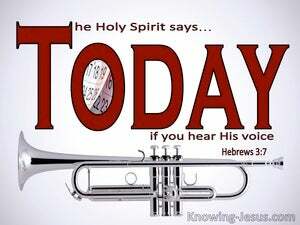 Therefore, as the Holy Spirit says, "Oh, that today you would listen as he speaks! seeing that the warning still comes to us, "To-day, if you hear His voice, do not harden your hearts as your forefathers did in the time of the provocation." 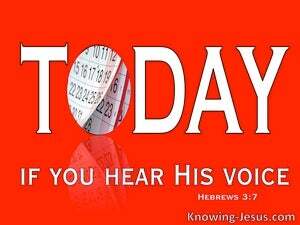 He again definitely mentions a certain day, "To-day," saying long afterwards, by David's lips, in the words already quoted, "To-day, if you hear His voice, do not harden your hearts." 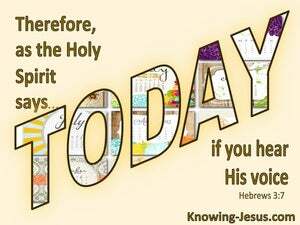 And the lesson which the Holy Spirit teaches is this--that the way into the true Holy place is not yet open so long as the outer tent still remains in existence. He was still speaking when a luminous cloud spread over them; and a voice was heard from within the cloud, which said, "This is My Son dearly beloved, in whom is My delight. Listen to Him." "In most solemn truth I tell you that a time is coming--nay, has already come--when the dead will hear the voice of the Son of God, and those who hear it will live. To him the porter opens the door, and the sheep hear his voice; and he calls his own sheep by their names and leads them out. And you also we, as God's fellow workers, entreat not to be found to have received His grace to no purpose. On the contrary encourage one another, day after day, so long as To-day lasts, so that not one of you may be hardened through the deceitful character of sin. Come, you who say, "To-day or to-morrow we will go to this or that city, and spend a year there and carry on a successful business,"